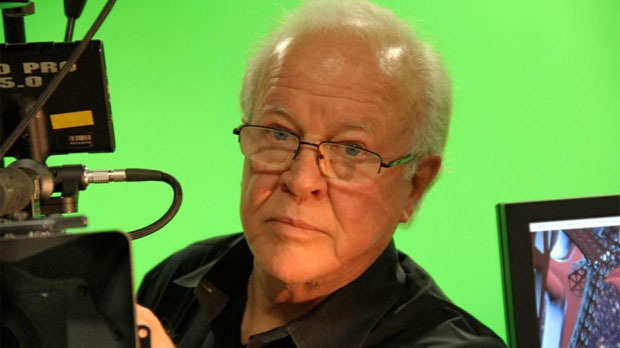 Douglas Trumbull has been behind some of cinemas most spectacular special effects. His impressive C.V. includes working on 2001: A Space Odyssey, Close Encounters of the Third Kind, Blade Runner and most recently Tree of Life. He also directed Silent Running in 1972 and Brainstorm in 1983, most remembered as the final film appearance of Natalie Wood. He has also been one of cinema’s great pioneers, always pushing technology to its limit, whether that be designing films for World Fairs, making rides for Universal and Luxor Hotels, or simply backing new technologies such as IMAX. Never standing still, the self-proclaimed “mad scientist” of cinema is still trying to push boundaries. Speaking at the Locarno Film Festival, where his pioneering work was being feted, 70-year-old Trumbull is still reaching for the moon and beyond. Filmmaker: You began your career by looking for a job as an animator in Los Angeles. Your first film, To the Moon and Beyond, appeared at the New York World’s Fair in 1964 and you were employed to do the illustrations and artwork. How did this film shape your career? Trumbull: This was a film shot in a very odd film process that has never been used before or since, which was a 10-perforation-high, 70mm film where each frame of film was a circle projected onto a dome screen. It was shot and projected through fish-eye lenses and projected onto a planetary dome. The film took you from the big bang to infinity in about 15 minutes. Stanley Kubrick and Arthur C. Clarke came to the World’s Fair and saw the film and I think now it must have been a seminal moment for them because it validated their concept that they could make 2001: A Space Odyssey, which at that time was called Journey Beyond the Stars, and that it would be possible to make a scientific, popular 70mm movie. Filmmaker: What was it like working with Stanley Kubrick? Trumbull: I sometimes say I was seduced, sometimes I say I was distorted, or sometimes that I was deeply affected, whatever, by working with Stanley Kubrick. I was a young impressionable moviemaker and my first movie was with Stanley Kubrick. I said, “If this is what movies are like then I want to do this all my life.” Then I found out that his attention to detail and manner of working wasn’t the norm. Filmmaker: What were your conversations with Kubrick like? Were they technical or conceptual in nature? Trumbull: He was so up on the technology, more than any director I’ve ever met. He was more astute and determined to understand everything, every lens, every camera. I don’t know if you have heard some of the legendary stories about Kubrick calling Eastman Kodak and saying, “One perforation on your machine is perforating the film and it is not right because it makes our film jiggle a little bit.” I’ve never heard another director in the world concern himself to that degree. Filmmaker: What were some of the challenges that you faced on 2001? Trumbull: I helped him solve some of them tricky problems that he was facing as a director because he wanted the moon to look real and we didn’t actually always agree on stuff, I think I did some stuff on 2001 that he didn’t like and we just agreed to disagree, for instance the moon terrain. I had seen a lot of pictures of the moon and my guess is that the mountains are really soft rolling hills and he was looking at all this Chesley Bonestell stuff — sharp grain, very dramatic mountaintops — and I got him to agree to let me build a model of the moon the way I wanted to. I spent days and days on the stage building this gigantic model of the moon as big as this room (6 metres by 6 metres) out of clay. [I was] very smoothly sculpting the clay, the way I thought craters would be and I worked out this technique of going 40 foot high up above the stage and dropping things onto the clay while it was still wet to create natural craters. It was utterly fantastic. He said, “I don’t like it. I want those Chestley Bonestell peaky mountains,” which is what we did for the movie. I think I would have done a better job, but we just agreed to disagree. Filmmaker: How did you design Jupiter together? Trumbull: The destination was going to be Saturn, because he liked Saturn’s rings and thought that was more dramatic, but at the time there was no good photographs of Saturn from space. So he said, “How do we build Saturn?” and all these artists, the professionals, high-paid illustrators, tried to paint Saturn. They couldn’t make it look real, because it was just a flat painting and he said, “Forget Saturn, we will do Jupiter and then we don’t have to deal with the rings.” So we started working on Jupiter and had the same problem. It was after I did the scanning for the Stargate sequences that I said, “I think there is a way of taking the Stargate scanning idea for the flat images and convert the process by making a spherical scanner,” which I called the Jupiter machine. I worked out that I could take a painting and scan it onto a spherical surface and he said, “Yeah, I like that.” He completely supported me to build the Jupiter machine. So there was that kind of symbiosis that we had, because he was questing after his mind’s eye view of things and when I could get there that got into the movie. Filmmaker: By the time you worked with Steven Spielberg on Close Encounters and Ridley Scott on Blade Runner, they had obviously seen 2001 and you had directed your own films starting with Silent Running in 1972, so were they much more willing to let you take control of effects? Trumbull: Yes, much more. I would often get sequences of the film pretty much to myself. I would design and direct the whole sequence, not that I didn’t work with them very closely, because I did, and I always appreciated their input and their desires and what they wanted things to look like. But they trusted me because they knew I was a director, I think directorially, so I could devise these sequences for all these films and they would pretty much back off and let me do it. Filmmaker: How did you design what have become the iconic UFOs in Close Encounters? Trumbull: That was Spielberg! He said, “I don’t want the UFO’s to look like a 1950s shiny disk, I would like it to look like the landing lights of an airplane approaching LAX at night,” which was lens flare, glare and beams and I said, “Okay.” He wanted them to look like faces and for them to be characters so we put eyes and mouths on them. If you look at all those UFOs they have faces, teeth and big eyes. He went more extreme but eventually backed off. He wanted to do McDonald’s golden arches and logos, because he had this interesting idea that the UFOs might do things to please us, they might try and make themselves more understandable to us by mimicking out culture. I thought that was a really interesting idea, but it got corny so we didn’t do that. Filmmaker: How was it then to work on the smaller budgeted Blade Runner? That always feels like a film that was lucky to have got made, which makes the fact that it turned out to be an all-time classic even more amazing? Trumbull: It was really easy, actually. It just came at the right time for my company because we’d set up this whole special effects capability for Close Encounters of a Third Kind and we had finished that and didn’t have anything to keep us busy when Ridley came along with Blade Runner. I was getting ready to make my own film, Brainstorm, and I said, “Well, Ridley, I’d love to help you out but your budget is so low you can’t really do very much.” He only wanted, like, 85 shots and we said, “Well okay, we will do our best,” and it was all cobbled out of junk. We were going to quit the production before it ended and said, “We are going to find another partner to fill in for us toward the end.” We found a really terrific guy who would have done a better job then I would because he had more time and gave it more attention to detail than I would have given it. Blade Runner is the beneficiary of Close Encounters. Most people don’t see that. 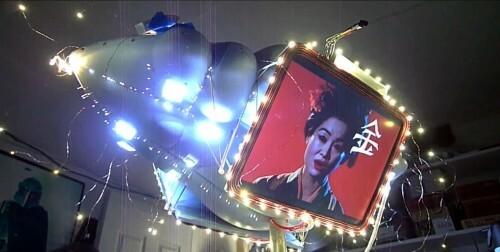 The mothership in Close Encounters, a lot of the lights, plastic model kits, fiber optics; the blimp in Blade Runner is the mothership, exactly same technique, same lights, same smoke room, same motor control, different shape but basically the same concept. So we were able to do Blade Runner for a tenth of what it cost to do Close Encounters because we didn’t have to invent anything. Filmmaker: And what about the fire flares? Filmmaker: Does exploding cities and doing special effects get easier with the computing power of today? Did you use more computers on Tree of Life? Trumbull: My personal opinion and the reason that I worked with Terry [Malick] on Tree of Life is that we are both amateur astronomers and we agreed that even the best space simulations that we are seeing from the biggest super computers don’t look super realistic even though they have worked out the dynamics and gravitational fields, etc. We agreed that it would be fun to experiment with this old-school, liquid-tank kind of stuff that we used on 2001 and Close Encounters and we had a laboratory to experiment with stuff. It became very easy to work with a Phantom camera, that shoots at 1000 frames per second, as a way to do a new kind of organic effect, because of the ability of high-speed camera to show these subtle fluid dynamic events that we would try to find a place for, whether they were a volcano on an alien planet or a dwarf star. We did not even know what we were using it for, we were just looking for amazing phenomena that would not be computer-generated. But we were also needing the help of Dan Glass, who was really a wonderful competent computer graphics guy, because the idea was to use natural photography but to also use digital compositing. We were using Nuke, which is the special effects program of the day, to take a real photograph of the Earth and to use Nuke to apply one of these organic effects to it. What I thought was so successful about the whole experiment was that it was almost entirely natural and we were using computers to do the compositing and not to generate synthetic things. That is where I would draw the line. Filmmaker: What are the benefits and deficiencies in your mind of using computers? Trumbull: Computers are great because they got rid of optical printing, which is a nightmare. I don’t want to see an optical printer again. That was always the hardest part, there was always matte lines and fake-looking things. My philosophy now is that I still like organic effects and miniatures, which are very unpopular these days. Nonetheless, we at our studio do organic effects and miniatures as a matter of course; that’s one of our core philosophies. If there is anything presented by a project that I want to do, I generally write it so I think I can achieve it with what I call an organic effect and miniatures, and I don’t write things that I know will have to be done by computers. Don’t get me wrong, water simulation is fantastic, Life of Pi is an amazing looking movie, it’s just that I don’t like spending my years in a computer graphics office. I don’t relate to computers and algorithms because I feel like there is too big a barrier between me and the output and I’m at the mercy of a computer graphics artist, I can’t participate in it. Filmmaker: Would it be different if you were the artist yourself? Trumbull: I thought about it and I decided not to [be one]. I spoke to a lot of people and they said, “Doug, you would have to spend at least two years at a computer, all day every day, to learn to be proficient at this task,” and I said, “I’m not going to do it,” and now I don’t. Filmmaker: You wanted to direct Brainstorm in a new type of cinema called Showscan, but you met resistance from an industry not wanting to update cinemas. Was that experience disillusioning? Trumbull: It was intended to be shot in Showscan. It was actually made in 35mm and 70mm. The aspect ratio changes while you are watching the film. I had these really horrifying experiences when the movie first came out. I said, “You’ve got to tell the projectionist and send a note with the movie that the aspect ratio will change during the movie.” That didn’t happen. “You have to tell them that the sound goes from mono to stereo.” They didn’t do that. 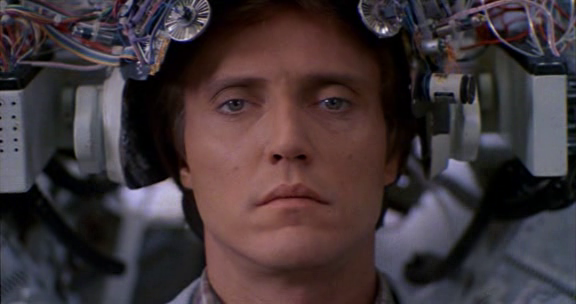 So I went to this screening in Chicago, it was opening weekend of Brainstorm and 70mm prints were going out there. This projectionist starts showing the movie. He’d never showed it before, he didn’t even test the reel and as soon as the screen size changed he stopped the movie, changed the mask in the gate, changed the curtain and then restarted the movie and then the movie changed again and he stopped again. It wasn’t until 30 minutes into the movie that he realized that that was the intention. People were having a completely horrible experience, and then we had all the stuff that happened in the days when the film was first converted onto video. There was no widescreen or letterbox, so they crushed the image, squeezed it in and you see old versions where widescreen versions of the video where it was actually shrunk. Filmmaker: You helped set up IMAX, yet many films shown at the cinema today are simply 35mm blow-ups. Does this process damage the IMAX brand? Trumbull: Yes. It’s a complicated equation, I think, because I’ve been familiar with IMAX for 40 years and I know that you are counting on persistence of vision and fusion for a series of still photographs to seem like motion. In an IMAX format that is grandly multiplying the field of view, to do this they found out that they had to move the camera much more slowly in order for it not to be objectionable to the audience. So all these IMAX movies that were these stunning, breathtaking views of canyons and vistas and underwater, all were made with very slow camera moves and a slow editorial pace, one cut per minute often. As a result, IMAX never really fit with dramatic storytelling — it’s fast cutting pace and over-the-shoulder shots did not look good. People that tried to shoot IMAX films, like shorts for World Fairs and Expos, always found the same problem, but later on I was involved in making IMAX public and bringing it into the commercial marketplace where IMAX invented this technology to up-res conventional movies. They call it dynamic re-mastering: they take a conventional movie and digital intermediate and go through an up-res process to get rid of pixels and remove the grain and improve the clarity, which is partially successful but doesn’t improve the frame rate. When IMAX had to make the transition to digital, they couldn’t get enough brightness because digital projectors have an upper limit of brightness and so they had to shrink their screens to 50 feet from 90 feet and make it less special, in my opinion. In spite of that, the continued success of IMAX conclusively proves that audiences want a more spectacular presentation: they pay more for it. IMAX has a very good business model of taking regular Hollywood movies and projecting them. I don’t want to denigrate it in any way, but I now know that we can do something different. Filmmaker: How would you improve upon IMAX? Trumbull: I’m working on a film process at the moment that is going to be quite unusual. We are now in a digital world where we are no longer restricted to film. It’s very simple to find digital cameras that will run thousands of frames per second. It’s easy to find professional motion picture cameras, which will all go at 60 or 120 frame per second digitally at a high resolution, 4K resolution. The projectors that are in theaters can run 144 frames per second; it’s not being used and it’s in place already. It’s an interesting new turn for me. I’m envisaging a new kind of movie process, a new kind of movie, a new kind of new movie content and a new kind of movie theater. I have no idea if I’m going to make it. It’s like a multiplex theater but every theater is actually spherical. It’s not like the movie is going to be projected on a dome, like I did in the World’s Fair, the movie will be projected onto a quarter of a dome. So the movie is actually halfway between an IMAX movie and a planetarium. It’s a wide field of view for the audience — it’s about 90 degrees wide — and the curvature of the film is such that the image is actually very bright. The screen is computer designed, will reflect light from projector beam to the surface screen and your eyes. The light is not wasted going through the floor, so it triples the amount of light, improves field of view and the projectors work at 120 frames per second. Filmmaker: What will the films be like? Trumbull: I’m working on a film right now that is an experiment for the process where we are shooting 3D, 4K and 120 frames per second and will project at 10 times the brightness of cinemas. The cinemas will vary in size, from 200-seat theaters or eight-seat cinemas which will be like the simulated rides like I did for Back to the Future at Universal and the Luxor hotels rides, where we proved that simulated rides are very powerful. It will be an opportunity to see the movie, the making of the movie and the ride of the movie all at the same time. The movies will be so unusual that they won’t make any sense on your laptop, television, tablet or cell phone. My objective is to go totally weird and make something people feel is really worth going out to a movie theater to see. Filmmaker: Do you think IMAX advocates like Christopher Nolan will take on this new technology? Trumbull: I have a personal mission to convince Christopher Nolan to try my new process. I think it’s the first time we have a digital process that is superior to 70 mm film and he’ll have to decide for himself. I keep saying, “Christopher, I’m going to show you,” and he is very dedicated to that IMAX look. He has done the best out of anybody; the most spectacular thing that I’ve ever seen on IMAX is the 70 mm release of [The Dark Knight Rises]. He is the best of the best, but even he knows that it’s not fun to have a noisy camera that weighs 300lbs. 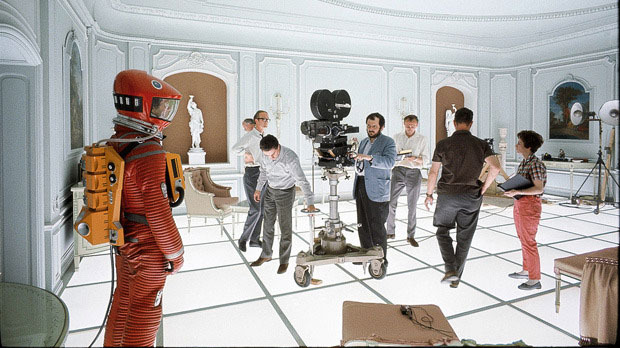 Filmmaker: Do you think Kubrick would have liked modern technology, faster frame rates, 3D? Trumbull: I think he would have loved it. I talked to him a few years before he died and he was completely unaware of what I had done with Showscan and was also unaware of what I had done with IMAX, because IMAX hadn’t actually set up yet in England. I think if he had lived, he would have loved this stuff, he would have loved what I’m doing now. He was all about extreme quality, image quality, depth, and color saturation — everything to make it look as good as it possibly could.